ANTHONY JOSHUA: ISLAND CHAMP OR WORLD CHAMP? Hall of Fame legend Sugar Ray Leonard recently brought up something on the minds of many fans when it comes to current three-belt world champ Anthony Joshua—When will “AJ” venture outside his home country safe zone to fight in America or other parts of the world? 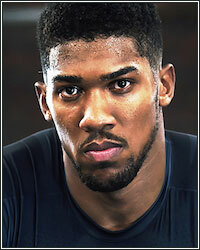 “It all boils down to what Anthony Joshua wants and what he believes in,” Leonard recently told SunSport. “You have to ask him the question: what do you want to be? How do you want people to remember you? “Do you want to just be remembered here [in the UK] or global? I’m sure it’s global. In America they know the name Anthony Joshua but they have not all seen him. Now, it’s not absolutely necessary for Joshua to take his show on the road or to try and win over the American fight fan. Joshua, who rakes in tons of cash and bathes in the adulation of his loyal UK fan base, can live and fight at home for the rest of his career and still retire a wealthy world champ with a Hall of Fame legacy. As a point of pride, Joshua and his team certainly seem tempted to keep the ball in their own court and defy the long-standing idea that a UK champ must venture abroad (and specifically to the United States) in order to validate his career. It’s a new day in boxing, the UK is a boxing powerhouse at the moment, and maybe this is the time to stand tall for bringing the world to his own front door. But, still, fighting on an island—even in this era of worldwide instant accessibility and reach—is still FIGHTING ON AN ISLAND. Historically, boxing’s heavyweight champion of the world has been an international ambassador for the sport, traveling the world and becoming one of the most recognizable men on the planet. And a base in the United States has served as a hub of accessibility from which the world champ can be that ambassador the sport needs. Joshua, who appears to be closer in temperament and business mindset to Wladimir Klitschko than Muhammad Ali, seems not at all responsive to the belief that he must leave home to take over the world. Is this simply a matter of proud defiance or one of logistics for Joshua’s promoter Eddie Hearn? It is, after all, easier to keep a rein on things if Joshua stays close to home rather than out and about in the world with thousands of voices whispering all sorts of things into his ears. Having a big fish in a small pond is just so much more manageable. Maybe pride and logistics both figure into Joshua’s insistence on staying in the UK. But, whatever the case, staying at home means leaving a ton of money on the table—money just waiting to be chucked at him by an international audience that wants to embrace a new, charismatic world champ. And, from a sporting perspective, some eyebrows do get raised when it comes to a world champ who has always insisted on home field advantage, even before he had the power to demand it. “I was in Cardiff for the Parker fight so I’d had a taste of the Joshua mayhem over here before Wembley,” Leonard said. “They absolutely love him, they support him and I truly believe he feeds off that. He is getting better and better.